Published: Aug 13, 2018 · Modified: Apr 11, 2019 · By Jen Sobjack · This post may contain affiliate links. 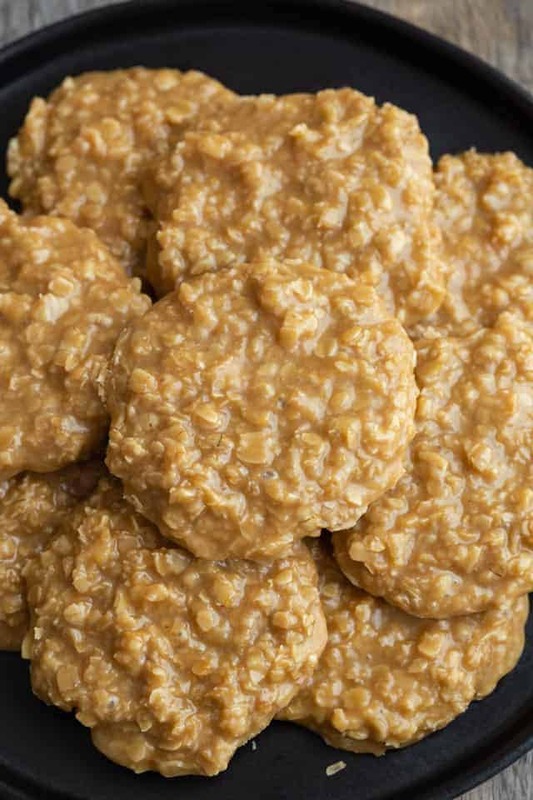 No Bake Cookies made with Cookie Butter are a tasty twist on classic no bake oatmeal cookies. This is one version you will want to make time and time again! 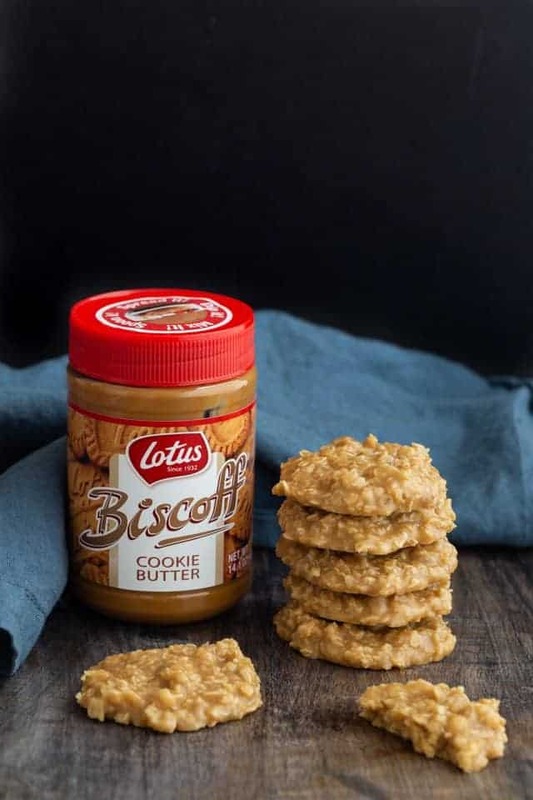 If you’re a long time fan of my site, you’ll know it’s no secret that I love Biscoff Cookie Butter. Cookie butter frosting and bourbon cookie butter cups are just a couple examples of how I’ve used this delicious spread in the past. 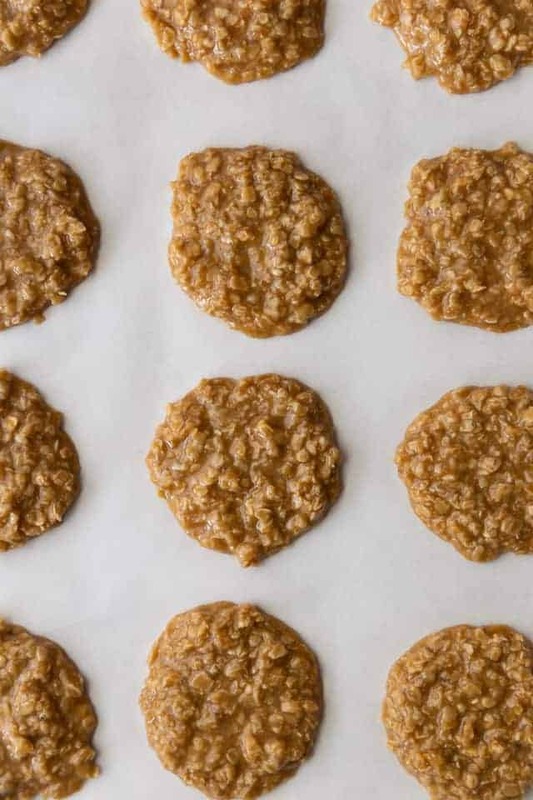 My husband is the mastermind of today’s delicious creation –> no bake oatmeal cookies made with cookie butter instead of peanut butter. This came about when he tried to make no bake cookies from a recipe off allrecipes.com. My husband is not a baker/dessert maker but he tries once in a while. His cookies didn’t turn out the way the recipe intended so he asked me to make some. Of course, I was up for the challenge but then he threw me a curveball and asked that I use cookie butter. He’d been scoping out my baking pantry and saw a half-used jar on the shelf. What better way to use it up?! I tinkered with the ingredient ratios to create a pretty darn good cookie. They are sweet but not toothache-y sweet. They are fudgy but not insanely fudgy. And they taste like cookie butter. It’s a win if you ask me. 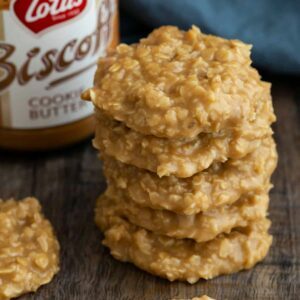 Why make no bake oatmeal cookies with Biscoff cookie butter instead of peanut butter? A small jar of cookie butter is rather pricey so you’re probably wondering why you’d want to buy it just to make cookies with it. If you are a lover of cookie butter, this is exactly why you should use it to make cookies. This recipe calls for a half cup of cookie butter which is about half of a 14-ounce jar. For everyday use, this half cup would probably go pretty fast. But, in this no-bake cookie recipe, it’s enough to make about 26 cookies. It’s such a great way to stretch that cookie butter and make it last longer! Yes, you can freeze no bake cookies and I highly suggest that you do. They will keep for up to three months in the freezer. Be sure to wrap them tightly in a sealed container. Thaw the frozen cookies in the refrigerator then set them on the counter to come to room temperature before serving. Where can I buy cookie butter? Most grocery store chains have cookie butter on the shelves next to the peanut butter. I’ve seen it in Walmart, Publix, and Target. Trader Joe’s carries their own brand. It’s also available on Amazon. 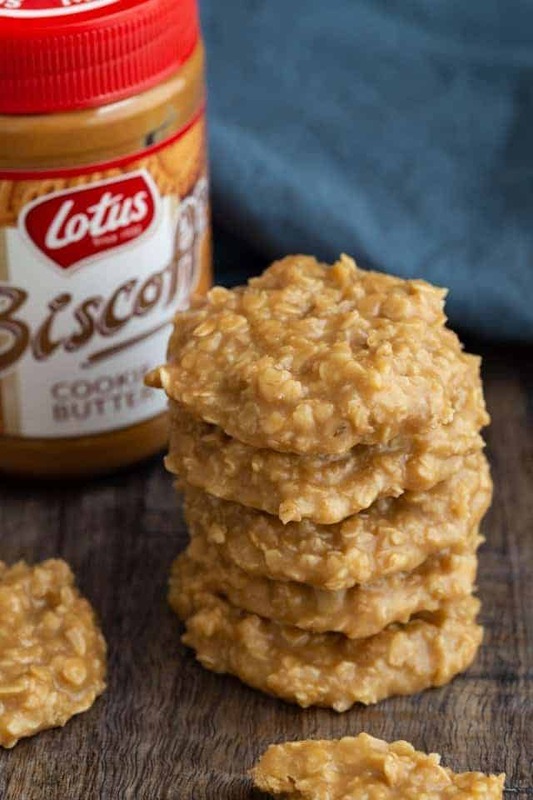 How to make no bake cookies with cookie butter? Bring butter, milk, and sugar to a boil and let it boil for one minute. Use a timer since cooking the base for the right amount of time is essential for perfect no bake cookies. Stir in cookie butter and vanilla. Make sure the cookie butter is fully melted and mixed in. Then stir in the oats and let the mixture sit for 1-2 minutes to soften the oats and thicken. Use a 1.5 tablespoon cookie scoop to scoop out mounds onto a baking sheet lined with parchment paper. If needed, use the back of the scoop to spread the mixture out to form cookies. Let the cookies sit until they’ve hardened, about 30 minutes. Why are my no bake cookies dry? This recipe calls for boiling butter, sugar, and milk to make the cookie base. 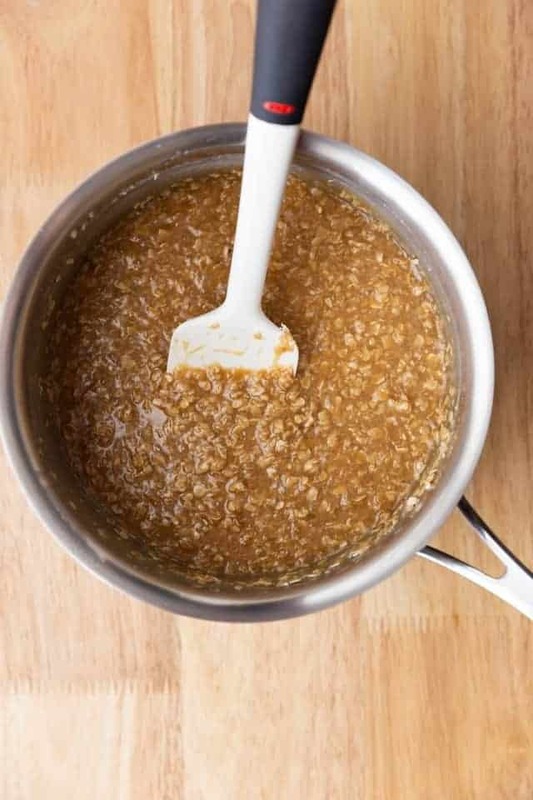 If the mixture boils too long it will cause the cookies to be dry and crumbly. Have a timer nearby and as soon as the mixture begins to boil, set the timer for 60 seconds. Remove the mixture from the heat as soon as the 60 seconds are up. Why didn’t my no bake cookies harden? Cooking the butter, sugar, and milk mixture for the right amount of time is essential for getting no bake cookies to set properly. If the mixture doesn’t boil long enough, the cookies will never set properly. 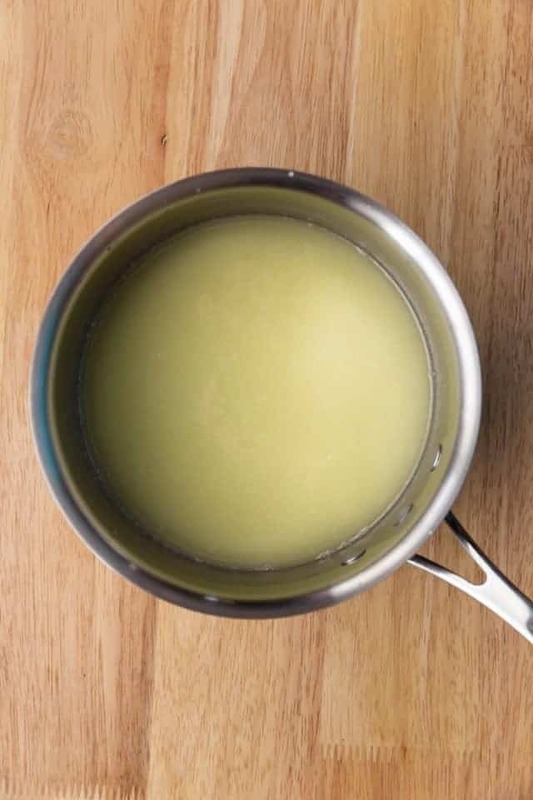 Start timing the mixture as soon as it begins to boil and let it boil for a full minute before removing it from the heat. Measure everything out before getting started. No bake cookies require you to move quickly so there’s no time to stop and measure as you go. Use a timer! This is the most important tip I can offer you. The base needs to boil for exactly 1 minute or the cookies will no turn out properly! Don’t scoop the cookies too soon. After adding the oats, let the mixture sit for a minute or two before forming the cookies. These couple of minutes will soften the oats and thicken the mixture so the cookies will hold their shape. Bring the sugar, butter, and milk to a boil over medium heat. stir occasionally as it’s warming up. Let the mixture boil for 60 seconds. Remove from heat and stir in the cookie butter and vanilla until melted and combined. Add the oats and mix until well combined. Let the mixture sit for 1-2 minutes until the oats have softened and thickened slightly. Use a 1.5 tablespoon-sized cookie scoop to drop mounds onto the prepared baking sheet. Use the back of the scoop to spread and shape the cookies if needed. Cool the cookies for about 30 minutes or until they’ve hardened. The cookies will keep for up to 1 week stored in an airtight container in the refrigerator. Freeze the cookies for up to 3 months. Thaw in the refrigerator then bring them to room temperature before serving. *Oats labeled “quick cooking” are necessary for this recipe. If you can’t find them, you can pulse old-fashioned oats in a food processor 4-5 times so they are finer. Just made these, and they are AWESOME!! We followed the recipe and instructions and they came out perfect. Very easy to make when following the steps. My new favorite and will be making them again. Thanks for sharing such lovely feedback, Marilyn! Hi Lorraine! I’ve never made these cookies with non-dairy ingredients and have no idea what to use or how they would turn out. Cookie butter is also less likely to kill people than peanut butter. Americans’ obsession with peanuts and peanut butter drives me nuts (hah). I will definitely be trying these sometime, it looks delicious. That’s a great point! It’s the perfect substitute for people with peanut allergies. I bet these are so tasty! I mean, who doesn’t love cookie butter? !